Our family Thanksgiving tradition is to spend the day relaxing and cooking together. 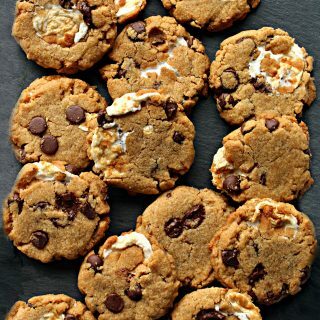 Everyone cooks and bakes their favorites. Some foods are the same each year, some are brand new recipes being attempted for the first time. I’m trying to incorporate the traditions of “new family members” into our meal as well. Last year I asked my daughter’s boyfriend and my son’s girlfriend what Thanksgiving food was important to them. They both said mashed potatoes. We haven’t been much of a mashed potato family. Until now. Last year’s attempt at crock pot mashed potatoes (it sounded like a good idea in theory) produced a cement-like substance that probably wasn’t what my guests were thinking of. This year, I plan to ditch the crockpot and aim for something light and fluffy. Wish me potato luck! I have no trouble dreaming up fanciful desserts. The hard part is being realistic about how much time some things take to prepare. I struggle with the concept of “keep it simple” baking or candy making. I start with a simple plan, then my mind takes off with ideas full of time consuming details. It’s a challenge to add details without adding time. The best way I know to create decorating pizazz, that’s quick and eye catching, is with sprinkles. (I may have mentioned that once or twice before.) For Thanksgiving White Chocolate Bark, fall leaf sprinkles do all the detail work in a flash. Melted white chocolate (I use Chocoley.com Bada Bing Bada Boom white candy and molding formula) is spread on a wax paper lined pan to create a blank canvas. 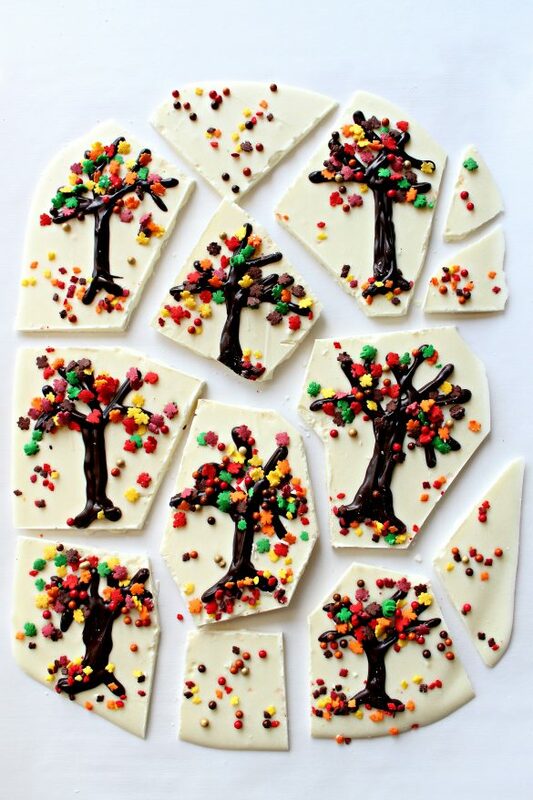 Melted dark or milk chocolate (I use Bada Bing Bada Boom dark candy and molding formula) is piped on to form preschool-esque tree trunks with branches. 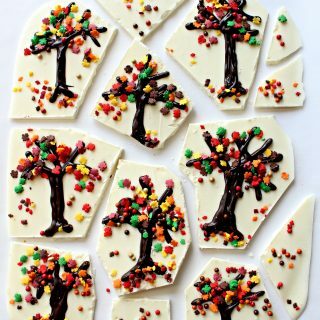 Leaf sprinkles turn the bare trees into fall trees, and boring chocolate bark into a special Thanksgiving treat or gift. Cut into individual portions and wrapped in cellophane candy bags, Thanksgiving White Chocolate Bark makes a lovely hostess gift, or a sweet surprise for each place setting at the Thanksgiving table. 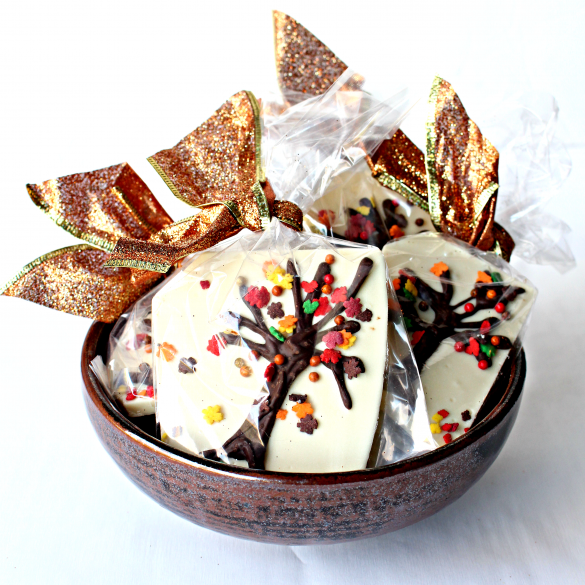 Care packages of Thanksgiving White Chocolate Bark, can help bring the holidays to loved ones away from home. Wishing everyone a sweet and happy Thanksgiving! Line a baking sheet or jelly roll pan (12" x 17") with wax paper. Set aside. Pour the melted white chocolate onto the prepared pan. 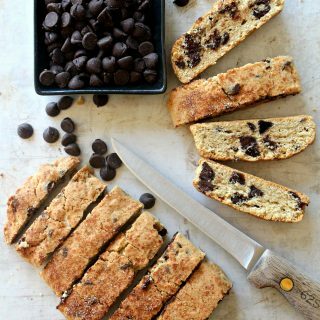 Spread evenly with a knife or spatula. Gently shake the pan side to side to even out the chocolate and smooth the surface. Cut a tiny corner off the bottom of the ziplock bag containing the melted chocolate. Pipe 8 or 9 tree trunks with branches randomly around the white chocolate surface. 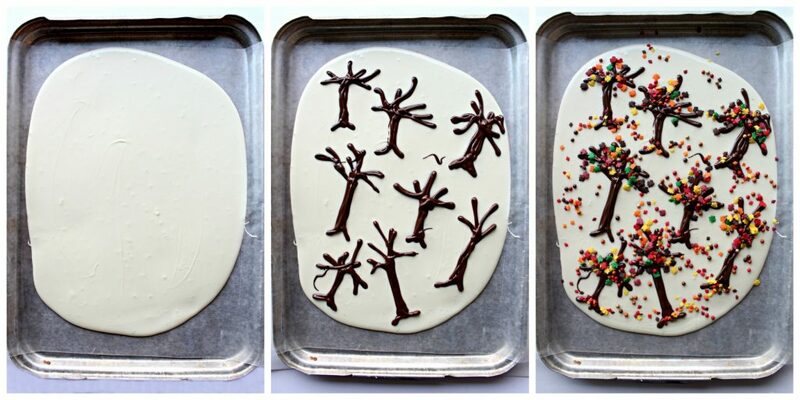 Sprinkle the trees with fall leaves sprinkles. Add additional sprinkle leaves and balls over the entire surface. This is the most adorable idea ever. 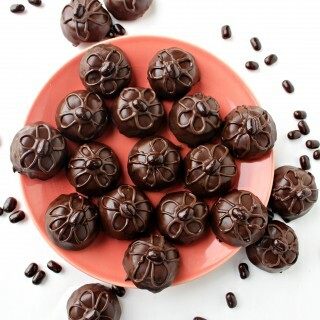 I love doing chocolate barks. 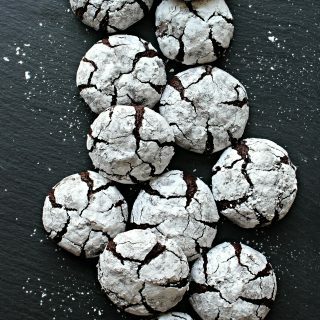 Would be a great one to make with the kids <3 Pinning for later! Thank you, Ashley! I am new to making chocolate bark, but I think I may be addicted! 🙂 This WOULD be a great one to make with kids! Thanks for pinning. Thanks, Kat! So easy and fun! These are so pretty. I also struggle with keeping the details simple. Thank you, Cindy! I think our shared struggle enhances our mutual understanding and blogging friendship. 🙂 I know Canadian Thanksgiving was a while ago, but I hope yours was happy as well! I hope your Thanksgiving was lovely and that your mashed potatoes turned out! It’s so nice that you asked new family members about their traditions – it can be easy for that to be forgotten! 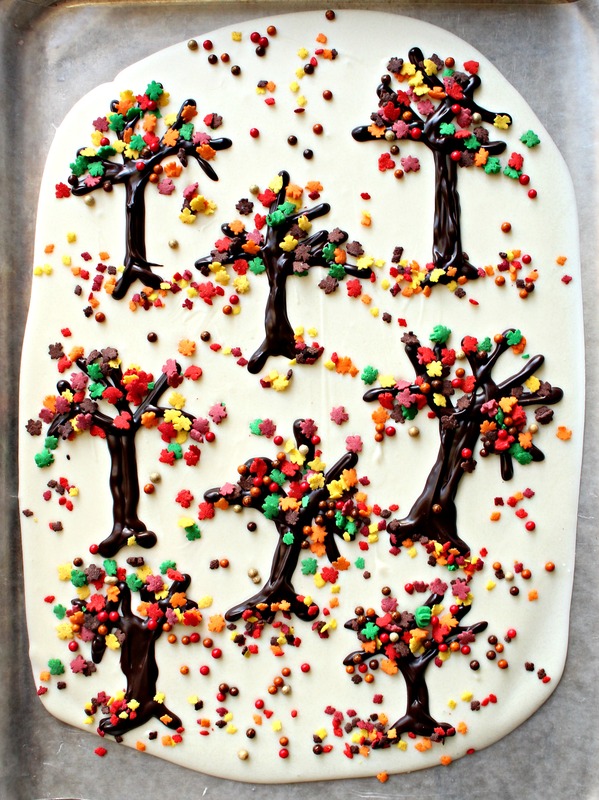 Love this fun white chocolate bark – it’s definitely perfect for Thanksgiving and to celebrate fall as well! 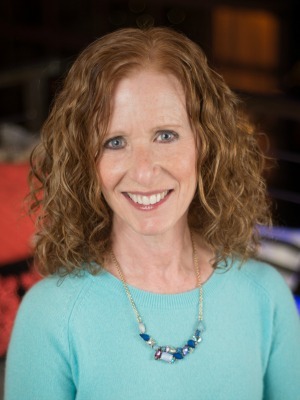 Thank you so much for sharing, and for being a part of the Hearth and Soul Link Party, Wendy! Thanks, April! The mashed potatoes DID turn out this year, thank goodness! I redeemed myself after a dismal attempt last year. 🙂 As one’s family expands with in-laws or future in-laws, taking the time to include everyone is so important. I want everyone to feel welcome and loved. 🙂 Thanks for hosting Hearth and Soul. There are always great ideas there! These are so beautiful! And easy to make too. Thanks! 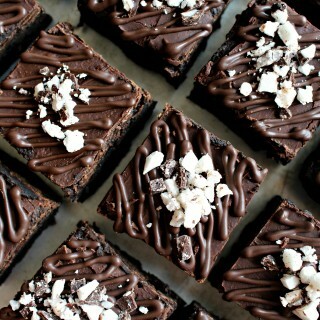 These look great and I bet they taste fantastic. I saw the picture on a link party and although the pic was small it jumped out at me. Thanks! I’m so glad you clicked through to see a bigger photo! 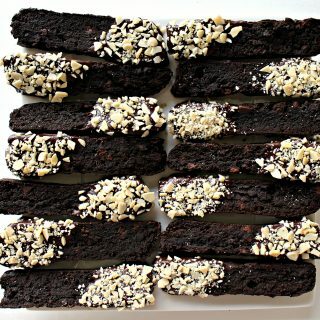 One of the best things about this bark (besides how good it tastes) is that though it looks impressive, it’s actually fast and easy to make! This is a great idea, and it really is strikingly pretty! 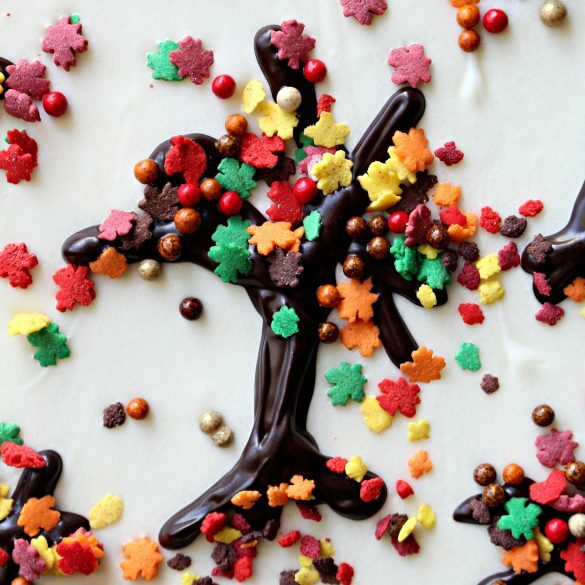 This is the prettiest Thanksgiving Bark, what a great idea! Hope you are having a great week and thanks so much for sharing your awesome post with us at Full Plate Thursday! I’m featuring this at Best of the Weekend tonight! What a cute idea. That’s almost too pretty to eat! Thanks for sharing at the What’s for Dinner party. Me and my son had a great time making this it was super easy and it turned out beautiful thank you for the recipe!! I am delighted that you and your son had fun creating together, Kayla! Thank you for taking the time to let me know. 🙂 Wishing you a happy Thanksgiving!